As the CELAM plenary in Brazil draws to its close, the final message of the assembled bishops of Latin America and the Caribbean is coming to light. The bishops are grappling with the fundamental question of how to inspire Catholics to take ownership of their faith, seek a personal conversion that leads them to follow Jesus, and live out that commitment in the church and the world. The church leaders must candidly examine trends in both society and the church that lead some Catholics to join evangelical groups while a much larger number remain Catholic in name only. The outcome should be pastoral guidelines for Catholics navigating amid the uncertainties of a region marked by explosive urban growth, uncontrolled environmental damage and wildly unequal income distribution that leaves nearly half the region's population without a decent livelihood, spurring massive migration. At 86 pages, the draft is far from the "brief and agile" document that one bishop promised. The structure is confusing, with overlapping themes resulting in redundancy and inconsistency in the depth with which topics are treated. Nevertheless, it is a good start that should improve with successive drafts. The draft begins with an overview of the changing world to which the church must respond, examining issues such as ecology and the faces of the "new excluded," including the elderly, prisoners and victims of trafficking. Some bishops, however, would like to see a more solid theologically based critique of the economic system that has excluded so many people from the fruits of the region's recent economic growth. In the description of "light and shadows" in the church, many of the strengths listed -- such as catechesis, liturgy, base communities and the use of the media -- are areas that bishops cited in the first two weeks of their conference as needing improvement or reinforcement. 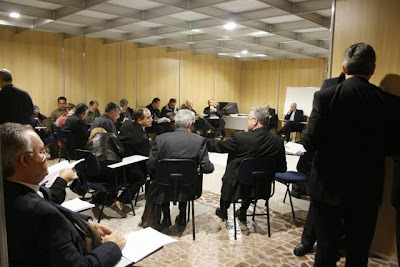 The draft describes weaknesses, including an overemphasis on sacraments to the detriment of the other aspects of faith life; financial troubles; clericalism; and discrimination against women and indigenous people. However, it offers few concrete steps toward solutions. Nearly half the draft is devoted to the theology underlying the bishops' views of discipleship and mission, with specific sections devoted to issues such as vocations and formation. The document emphasizes the need to make Scripture central to Catholic life, a constant theme since the pope's speech May 13. It also notes the centrality of the Eucharist, a difficult challenge in a region with an average of one priest per 7,000 parishioners. Christian initiation, continuing formation and Catholic education are seen as key to developing a sense of missionary discipleship. This must be further nourished through participation in groups such as base communities or lay movements, which are given relatively equal weight in the document, although they tend to reflect different ideological stances. Some inconsistencies in the draft language reflect undercurrents of tension, although several observers have said the tension is less overt than it was at the 1992 general conference in Santo Domingo, Dominican Republic. One inconsistency involves the use of the terms "base ecclesial communities," "ecclesial communities" or "small communities," depending on the section. The difference, which proponents of base communities say is one of substance rather than semantics, apparently reflects differing viewpoints among the members of the 16 subcommittees that drafted the different sections. The last third of the document describes pastoral priorities that reflect the faces of the "new excluded." It also calls for renovation of church structures, but offers few concrete recommendations for change. As plans for the fifth general conference developed over the past year and a half, the greatest expectations were not of a document, but of a "great continental mission" that would breathe new life into evangelization. Little was said about the mission until May 24, when Cardinal Claudio Hummes of Brazil, who now heads the Vatican's Congregation for Clergy, raised the subject in the assembly. Afterward, he told journalists that the goal is not to convert non-Catholics, but to reach baptized but inactive Catholics. Some bishops envision door-to-door canvassing, while others say that is not the main thrust. They must still define how and by whom the mission will be carried out. One prelate commented that the region's conferences of bishops differ in their degree of enthusiasm and preparedness for such an effort. Another pointed out that before a "great continental mission" can be launched, the church needs high-quality promotional and training materials. The bigger question, however, is to what kind of church lapsed Catholics are being invited to return. If it is structurally the same one they left, there is no reason to expect them to stay. Unless the bishops answer that question, neither the final document nor the great continental mission will have the desired effect.